In 2010 the US mining and gas company, Renco, managed to successfully avoid having to pay compensation to Peruvian locals who were harmed due to pollution by their companies by successfully using a provision of the Peru-US Trade Agreement. Not satisfied with avoiding having to pay compensation, the company has since demanded $800 million from the Peruvian government as they argue that one of the companies they own, Doe Run, was forced into bankruptcy due to an expensive pollution clean-up which the Peruvian government required Doe Run to conduct . It is with this understanding that on Monday 10th March of this year, the fourth round of negotiations of the Transatlantic Free Trade Agreement ( TAFTA )or the Transatlantic Trade and Investment Partnership (TTIP) got under way. 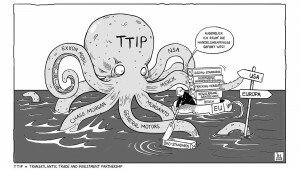 In a nutshell, TTIP claims to be a free trade agreement between the US and EU which will lead to an increase in employment and income in both economic areas and create the largest free trade area in the world. This agreement, if implemented, will have far-reaching and potentially very dangerous consequences and yet practically nothing has been written on the subject in the media and discussion on the matter is worryingly absent. The TTIP was brought up twice in the vincent brown debate on membership of the EU. Here is a petition site to stop the talks on the Transatlantic Trade and Investment Partnership or TTIP. This is a very good initiative being taken in regard to TTIP. I add this video from where I got the info, even though it's in French it would be worth subtitles. The latest article from George Monbiot. Unlike Enda, the Austrian Chancellor is prepared to fight the TTIP. 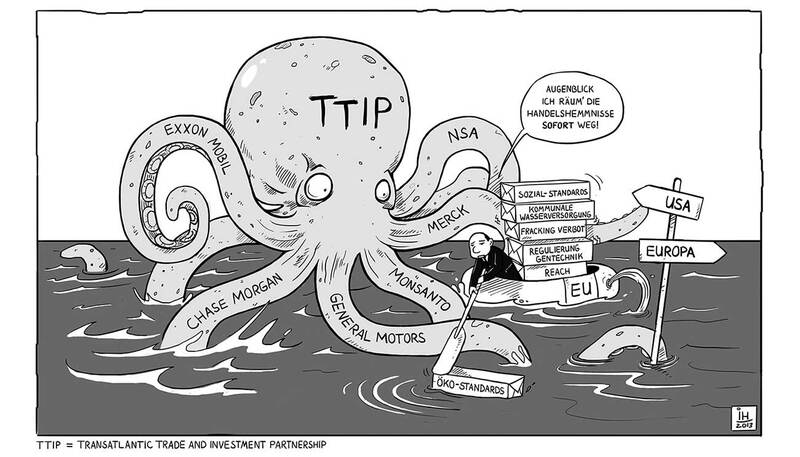 over the EU’s intention to sign the Transatlantic Trade and nvestment Partnership (TTIP) with the United States. Translation : “there can be no democratic choice against the European treaties”. you have to subscribe to get the whole article, sorry. Philip morris sueing Ireland over plain packaging is a wake up call for Ireland. The Transatlantic and Transpacific Trade and Investment Partnerships have nothing to do with free trade. “Free trade” is used as a disguise to hide the power these agreements give to corporations to use law suits to overturn sovereign laws of nations that regulate pollution, food safety, GMOs, and minimum wages. Better keep hassling them during the summer!